Please pray for Deacon Ian Gordon (Dunkeld) who died yesterday. The Reception of Remains will take place on Wednesday 27th September at 6.00 pm in St. Fergus, Forfar and the Requiem Mass on Thursday 28th September at 11.30 am. Clergy wishing to attend please advise the Chancellor, Malcolm Veal. Deacon Paul’s funeral will take place on in St. Joseph’s, Greenock on Tuesday 30 May at 12 noon with the Reception of Remains immediately preceding the Funeral Mass. Thereafter to Knocknairshill Cemetery. Please note that the study day on the 20th May has been cancelled . The Commission will look at how best to provide on going formation in the future. With regret, the death of Deacon Paul Rodger has been announced today (17 May 2017). May he rest in peace. This will take place during the regular 11 a.m. Mass in St. Andrew’s Cathedral, Dundee on Sunday 4 September 2016. Any deacons attending are invited to bring GREEN vestments. Kris Jablonski was ordained deacon by Bishop Stephen Robson on 4 August 2016 in St. Anrew’s Cathedral, Dundee. Originally from Poland, Kris has lived in Perth for some ten years with his wife Teresa. They have four daughters. Kris expects to receive his first pastoral appointment in September. 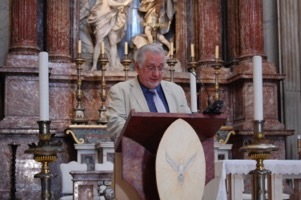 The above picture showsDeacon Tony Schmitz speaking in Rome. The occasion was the Year of Mercy Jubilee for Deacons. Sone two thousand deacons from all over the globe participated. It was the largest gathering of deacons ever held. 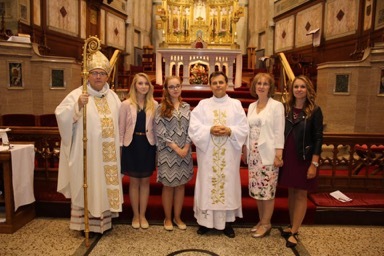 On the Friday there were assemblies held in three different basilicas – for Italian-speaking deacons and their families, for Spanish-speaking deacons and families, and in the beautiful St John the Baptist Basilica of the Florentines for the English-speaking deacons and their families. Naturally the largest Anglophone contingent was from the United States. Four deacons from Scotland represented the Scottish deacons. Graham Kelly from Paisley Diocese and Bill McMillan and Tom Gorman from the Diocese of Motherwell. When I met with Bishop John Keenan not long after his appointment as Bishop President of the Commission for the Permanent Diaconate I indicated that as I was now in my 10th year of serving on the commission and as my term of appointment was drawing to a close that I felt it was an appropriate time for me to stand down as National Director. I am pleased to say that Deacon Graham Kelly has been appointed by the Bishops' Conference as the next National Director and will assume the role at the beginning of April. 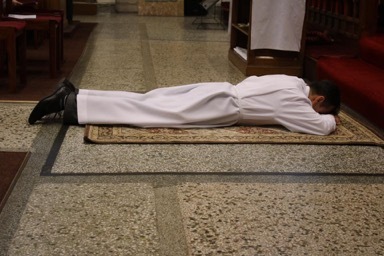 I would like to take this opportunity to thank all those who have served with me on the commission during the last 10 years, deacons, priests and bishops. I'm sure you will join with me in offering Graham our congratulations and assuring him of our prayers and support.